Testing the water … members of the Triam Suksa school's Swimsafe Sharks club. The leading cause of death in children aged one year and over in Thailand is drowning. Nearly 2,650 children a year die this way, and it was on learning of these statistics that staff at our school, the Triam Suksa school in Soi Dao on the Thai-Cambodian border, decided things had to change. 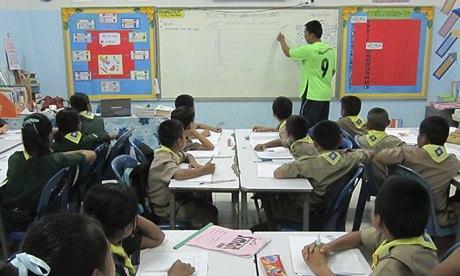 The Triam school works towards inclusive education, which is not the norm in Thailand. It's in a rural location in the far east of the country, surrounded by the mountains and fruit farms in Phu Soi Dao national park. The nearby villages are a far cry from Thailand's tourist areas; pupils' families so far this year have had to deal with flash flooding, malaria and dengue fever. I settled here five years ago with my family, when the credit crunch kicked in, and have never looked back. I started to teach and help out at the school because they opened their arms to my eldest son, who is eight and has ADHD. Some of the children come from disadvantaged backgrounds and some have special learning needs. For them, we've opted to create a portable swimming pool and water safety programme to encourage awareness of the grave problem of youth drowning. It will consist of a 12m x 6.5m portable pool, with built-in sun protection. (With temperatures in the high 90s fahrenheit and above, this is a definite requirement.) The whole thing will cost around US$10,000 and it'll be completed in January this year, after which the safety programme can begin in earnest. We already have our own swimming club: the Swimsafe Sharks, which has 450 child members between the ages of five and 11. Right now, it's a case of asking the Thai teachers to give lessons in the classroom on water safety, while we wait for the pool to be finished. Jack, one of our teachers here, recently finished his degree in sport education in Bangkok and is particularly interested in helping see the project through. "Swimming is a lifelong lifesaving skill and more needs doing to get it taught in schools in Thailand and south-east Asia," he says. "I've known many people throughout my life who have died as a result of drowning – not just kids but adults too – because there are not the facilities to teach swimming in Thai schools." When construction is finished and the programme is up and running, we want to raise funding not just for our own water-safety education project, but also for the Global Drowning Fund – an Australian charity devoted to combating Asia's drowning epidemic. 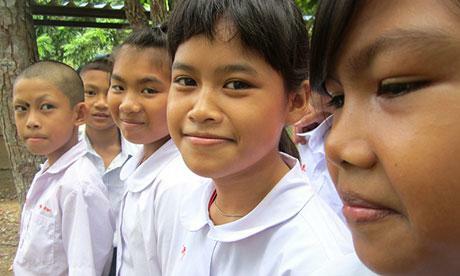 Our aim is to get this type of project into other rural Thai schools. The Triam Suksa portable swimming pool project is only possible through assistance from the private sector – in particular the Bangkok Charity Orchestra, whose recent concert at the Intercontinental Hotel in Bangkok raised US$8,000. We are also supported by Bangkok Movers & Shakers, an organisation that holds corporate networking events to raise money for Thai children's charities, which has already supplied our school with a playground. This is our opportunity to grow and share. We as a school have been given this opening, and we want to give in turn to other schools and education bodies in Thailand, and to shed some light on this huge – but not new – problem of child fatalities through drowning. If we can keep things at a low budget, there's no reason why the government and private sector can't help further other projects such as ours. • Contact the Triam School Foundation for more information on the project. Babies should be introduced to swimming pools by 6 months. at this age they will 'swim' naturally and get used to it. It will build their natural instincts. Should they ever fall into a pool as an infant there after they will naturally be able to save themselves to an extent. This is old news. Swimming pools in Indonesia are usually only 1.5m deep as many maids fall in the pool and drown. Swimming in Asia apparently in not popular! I'm lucky in that I was brought up in a school where swimming was an obligatory skill. My daughters swim like fish because, our friend next door has a pool and accessibility to pools in Udon Is cheap and available. So for kids in the country its a great initiative. A total waste of time. They'd save more lives teaching Thais to drive correctly. They need to get their priorities right. I'd bet more kids get killed on Thai roads per year. This should be taught in every primary and secondary school in the World. They'd save more lives teaching Thais to drive correctly. I'm not so sure that they could be taught such a thing. Don't know if leaning to swim would save many kids out my way, lose 3 to 5 every year from this area. Teaching them that rivers in flood are dangerous, currents are too fast, kid loses it's footing and is off down stream, trees, logs smash them. Last edited by jamescollister; 09-10-2013 at 10:30 PM. Exactly. I can't see how you came to the conclusion that because lots of people die on the roads, that it's a waste of time teaching kids how to swim. Can't even begin to get my head around that. I'd bet more kids get killed on Thai roads per year. never see our coloured brethern in swimming competitions. And he did not have to swim the Mediterranean,he swam through the system. Cannot see it happening again,must be better selection process. Thai swimmers competed last week 5 Oct in the FINA 10km Marathon Swimming World Cup 2013 held in Hong Kong. Apart from world rankings, series' results count as qualifiers for the Rio Olympics 2016. World's top/elite 36 women and 45 men competed - including many from last year's London Olympics. Thai swimmers finished 23rd(women) and 28th (men). Both events were won by swimmers from Brazil, ideal lead-up to the Rio Games in 2016. I coach children's water safety, as well as swimmers aiming for provincial competitions and ideally qualify for the nationals. As coaching standards improve, so will the swimmers. After both Eddie the Eagle and Eric the Eel they changed the entry conditions for the olympics. Athletes now need to have a certain ranking in the sport. ^ So it is now more difficult to obtain that visa.